2015 EnVision Conference Registration is now open! 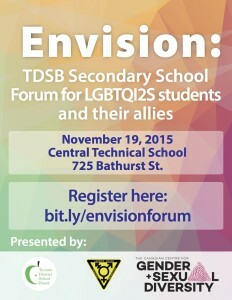 The Toronto District School Board and the Canadian Centre for Gender and Sexual Diversity are excited to announce an upcoming conference for TDSB secondary school LGBTQI2S students and their allies! This conference is for youth and educators and focuses on issues of homophobia, transphobia, transmisogyny, bullying, sexism racism, ableism, and discrimination in schools. It’s a full day of workshops, speakers, and resources specifically designed to suit the needs of your school community. Students involved with gay straight-alliances, queer-straight alliances, equity clubs or groups of engaged students interested in social justice, are encouraged to attend. 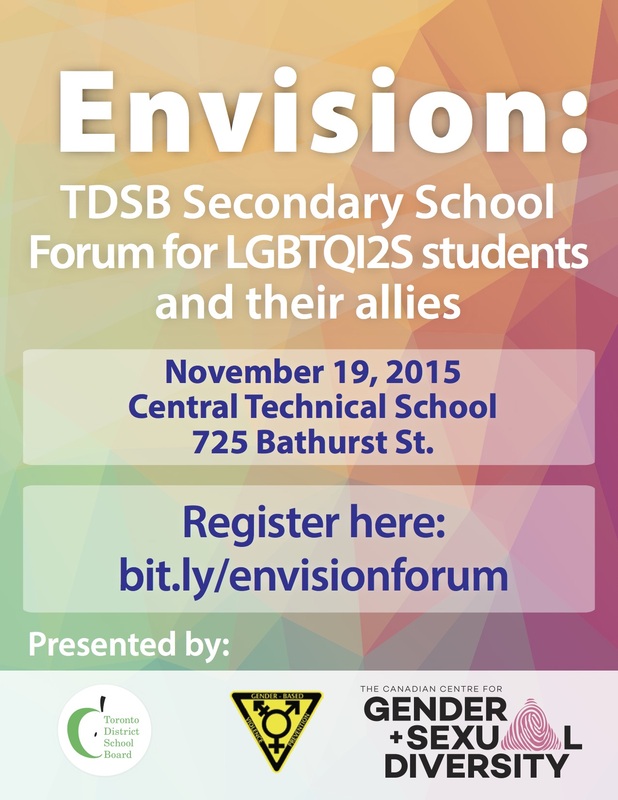 We welcome you to come and engage in learning about how to create safer schools, free from homophobia and transphobia and other forms of oppression. Sessions also include teacher training on engaging students in conversations about Healthy Relationships in a queer and trans* inclusive way. The full conference program has now been uploaded to the website.